Tranquil and romantic best describes this lovely bouquet. 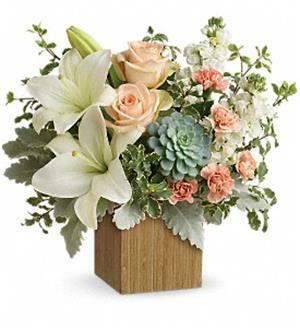 Peach roses, white lilies and succulents designed in a rustic wood cube gives a modern touch to a classic arrangement. Perfect for a special moment and a special person. Flowers and containers subject to availability and season. Some substitutes may be necessary. Peach roses, white asiatic lilies, peach miniature carnations, and white stock are accented with pitta negra, dusty miller, and a green echeveria succulent. Delivered in a Natural Wood Cube. Approximately 14 3/4 W x 13 1/4 H Flowers and container used subject to availability and season. Some substitutes may be necessary.